BE CAREFUL WHAT YOU ASK FOR, you just might get it. That’s essentially how it’s shaken out with the new generation of QLC solid-state drives. QLC, of course, refers to the quad-level cells in the latest NAND flash memory, translating into four bits of data stored per cell, and thereby increasing storage density over existing TLC or triple-level cell NAND by a hefty and instant 33 percent. What’s not to like? With the Crucial BX500 and Adata SU630, quite a lot. The downsides to QLC memory are the same in character as every other increase in NAND memory cell data density to date. The problem is scope. When the original single-level memory cell was usurped by MLC cells, which store two bits per cell, both performance and endurance suffered. That happened again when TLC upped the ante to three bits per cell. Here we are again with QLC memory, and thus far, the downsides have been even more painful. To put some really rough numbers on all this in terms of endurance, SLC memory is good for about 100,000 program-erase cycles. By the time you get to QLC NAND, you’re looking at more like 1,000. As for performance, suffice to say that QLC involves 16 possible voltage levels per cell, and that in turn makes reading and writing data extremely laborious. 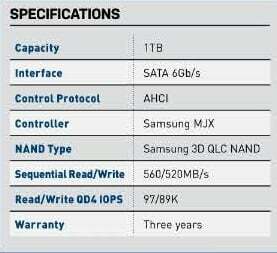 This is the context for Samsung’s new 860 QVO drive. 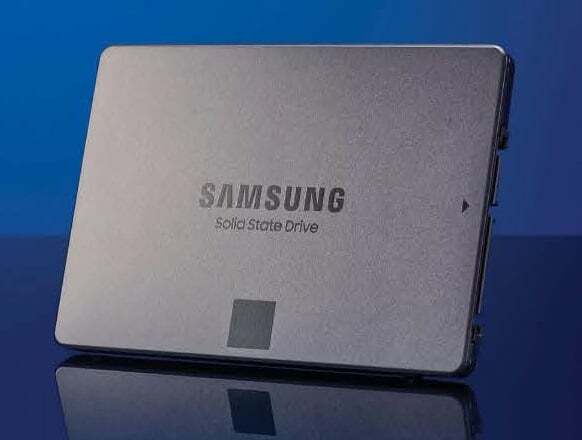 The 860 QVO is essentially a QLC- powered update to Samsung’s existing 860 EVO 2.5-inch SATA drive. As you’d expect from a QLC product, it majors on capacity. It uses the same hardware platform as the EVO, including Samsung’s MJX controller chip, and the same 1GB of LPDDR4 cache memory. But this 1TB model is the smallest 860 QVO on offer, alongside 2TB and 4TB alternatives. The headline performance claims are very similar between the EVO and QVO, too. Until, that is, you look at the finer details. Samsung says the QVO is good for 520MB/s writes when operating a chunk of its QLC memory in faster SLC mode. It rates the underlying performance of the QLC memory at just 160MB/s for writes. By default, the 1TB QVO has 6GB of memory partitioned off for high-speed SLC operation, with a further 32GB available for dynamic partitioning into SLC mode. In our testing, the steps in performance are obvious enough. When writing targe sequential data sets internally on the QVO, transfer speeds start at around 500MB/s before quickly dropping to 250MB/s. That’s the DDR4 cache filling up. After a further five or six GB, it drops to just 60MB/s. We couldn’t see any evidence in that workload of the further 32GB of memory being dynamically allocated for SLC mode. The upshot, as it has been with the other QLC drives we’ve tested, is that you’re exposed to the underlying performance of that slow QLC memory pretty quickly. As for our official benchmark results, the sequential numbers reflect the drive’s performance using the DDR4 cache, while the 4K random access performance is reasonable, if a little disappointing in terms of reads. In the QVO’s favor, the 30GB internal file copy test shows that it does a better job of masking the inherently poor performance of the QLC memory than its direct competitors, but it’s still far, far slower than the 860 EVO with its TLC memory. not a lot cheaper than an MLC drive.